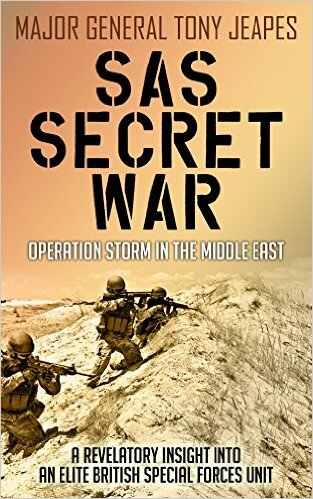 “SAS Secret War” eBook was published in 2015 and was written by Tony Jeapes. This is the only book General Jeapes (ret) has written. General Jeapes was a unit commander with the SAS and deeply involved with the conflict. He was the commanding officer of the SAS in Dhofar from 1974 until the end of the war. I received a galley of this novel for review through NetGalley. I categorize this novel as ‘PG’ because it contains some scenes of Violence. This Non-Fiction novel tells the story of the British SAS involvement in the Dhofar War. This covered a period from 1970 through 1977. The book tells about the people involved in the conflict, the SAS troops and the Dhofari who formed the militia they worked with. It tells of the difficulties of working with the tribal people to form the militias. Several battles are described in detail. I thought that this was a good military history. It details a time I had not previously been familiar with. The 6+ hours I spent with the 250 page book were interesting. It was a little dry, but then that is not too unexpected for a Non-Fiction novel. It started off slow, but did get better after the few chapters. I give this book a 4 out of 5. The Star Wars App has been out for a while. 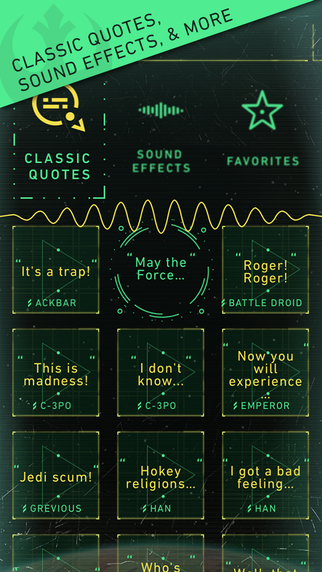 Since Star Wars 7 officials opens on Friday, I thought this was a good time to mention this App. You can get it from the iTunes App store for free. It is recommended that the app be used on an iPhone 5 or more recent. I just finished reading the Siege of Denver by Brendan DuBois (http://www.brendandubois.com). Mr. DuBois has published 16 novels and many short stories. This short story can be read on the web. I categorize this novel as ‘PG’ because it contains scenes of Violence. This Young Adult Science Fiction novel is set in a future where Earth is under attack by an alien race. The primary character is Melissa MacKay, a Private in the 157th Infantry Regiment, Colorado National Guard. She and the rest of her thin squad are manning the trenches around Denver. Denver is under siege by the Creepers – insect like aliens that attacked Earth a decade earlier. The Creepers have taken out all electric and electronic sources around the planet, essentially plunging the Earth into a near nineteenth century state. When supply balloons are launched to assist the besieged Denver, a pair of Creepers come out of their protective dome to intercept them. Only Malissa and her squad mates can intercede. This is very short story, only taking about 20 minutes to read. I did really like it though. It is set in the author’s “Dark Victory” due out next year. If the novel is anything like the short story I will have to read it. I give this short story a 5 out of 5. 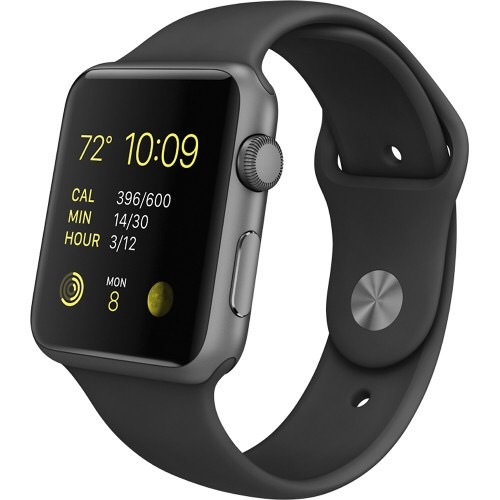 Do you need to rush out and buy an Apple Watch? Well, I would say there is no compelling reason . . . at the moment. Having said that, I have an Apple Watch and have worn it every day for a few months now and I love it. Why do I like my Apple Watch? I like to use it for monitoring activity – I used to have a Nike Fuelband to count steps and measure calories burned, but it died. Using the Apple Watch fills that gap now. I like that the Watch has the ability to specify using an elliptical. These are not exactly critical, compelling applications, but I like my Apple Watch. I’m glad I bought it and will continue to wear it every day. I had given up wearing a watch some years ago, relying on my cell phone for that function. Now with my Apple Watch it seems natural to glance at my wrist again. The Apple Watch is not for everyone, but I am glad I have mine! Gourdough’s Donuts (1503 S 1st St., Austin, TX 78704) is one of the popular food trucks around the Austin area.My wife and I visited a few weekends ago and were very impressed. So, what makes these donuts different? The toppings!!!! On our visit I had a Cherry Bomb (Glazed Cherry-Topped Holes, Cinnamon, Sugar & Cake Mix Topping) while my wife had a Heavenly Hash (Marshmallow With Chocolate Fudge Icing Topped With Brownie Bites). They were both very good. I am looking forward to going back and trying one of the other 23 toppings that Gourdough’s offers. 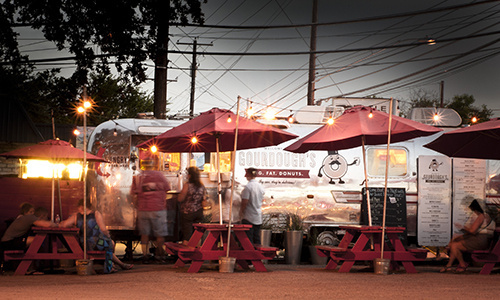 If you are in the mood for a great desert and are in South Austin, Gordough’s is a great place to stop. If you are out-and-about, then the Roaming Hunger App is a great way of seeing if Gordough’s is open, or to find any Food Truck around Austin. More information can be found at artisanalsoftwarefestival.com as well as on the web sites of the participating companies. There is not a bundle, but each package is offered at a separate discount (20%-25%). These software packages are not inexpensive, so the discounts being offered are significant. If you are in the market for any of these great software packages, now is the time to buy! Have you ever wanted to see how well your system performed? Or compare two systems? One way to do that is an way is with the application Geekbench 3 from Primate Labs. This program is cross platform with version for Windows, Mac, Linux, Android and iOS. A free version is available, with expanded versions ($9.99, $14.99 and $99.99) for purchase. The software can be downloaded from the web site and run on your system. 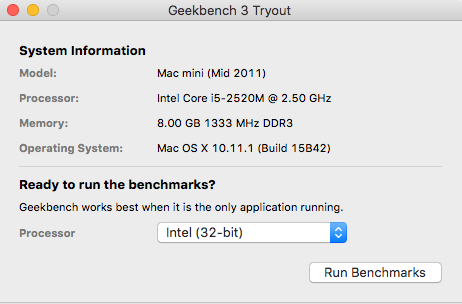 When I ran Geekbench 3 on my 2011 Mac Mini, it took just over 2 minutes to complete the test. Tests are performed with a single and with multiple cores if they are available. Tests simulate real-world use including encryption, compression/decompression, floating point and memory performance. There is a detailed description of each test Geekbench 3 performs on the web site. Primate Labs provides a reference chart for both Macs and PCs for comparison. This App is not something I will use every day, but is nice to have in my digital tool box. Did you know Cult of Mac Had an App? I have read Cult of Mac articles for some time. I only discovered that they had an App for iOS devices this past weekend. 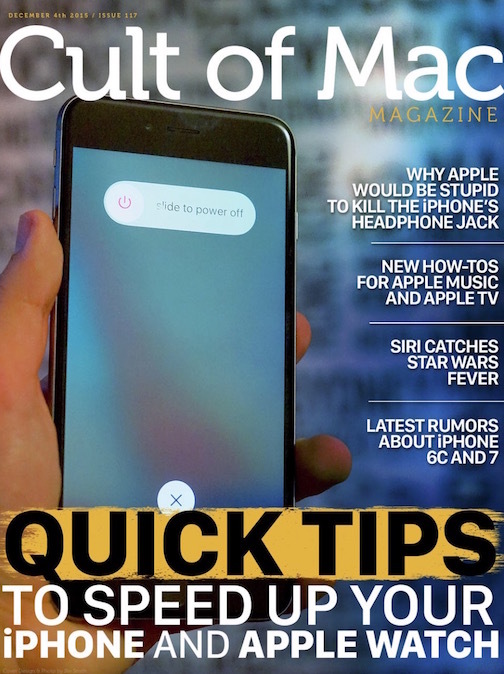 The “Cult of Mac Magazine” App is free and is updated weekly with the latest issue. The App includes access to all back issues (the latest issue is #117) of the magazine. The length of each issue of the magazine varies, but each has about two dozen stories. If you regularly visit the Cult of Mac web site, or subscribe to their RSS feed, the articles contained in the Magazine will be familiar to you as the content is the same. The App does enable you to automatically receive the new issue each week. The App does lay out the articles nicely and the user interface was easy to use. Touching the cover of an issue brings up an images with a short explanation of each article. These scroll left horizontally so you can see the stories contained in the issue of the magazine. Touching the image will open the article, which is read by scrolling vertically. You can switch to other articles by swiping left or right on the screen. There is a search function (click the menu icon in the top right corner of the screen) which allows you to search all editions (at least those not yet archived, #96 forward at this point) of the magazine. I downloaded the App and it works well, but it does not handle being offline. I put my iPad in Airplane Mode to test the App. Images embedded in articles are not displayed and the App is very sluggish. The exception is for any article you have opened while connected. In that case the images are present and reading is smooth even when in Airplane Mode. The Cult of Mac RSS feed is one of about 100 feeds that I am subscribe to and read daily using the FOSS program Vienna on my Mac. Looking over the past few issues of the Magazine, I am not motivated to drop the RSS subscription. 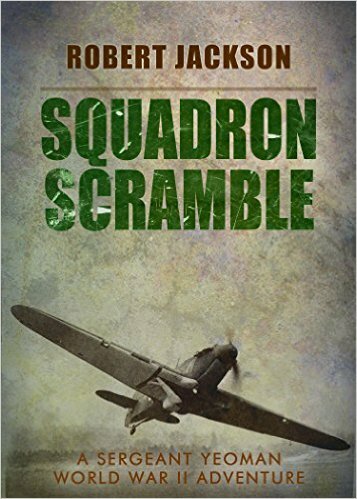 “Squadron Scramble” eBook was published in 2015 and was written by Robert Jackson. Mr. Jackson has written several books, both Fiction and Non-Fiction, on World War II, with a focus on aircraft of the era. I received a galley of this novel for review through https://www.netgalley.com. I categorize this novel as ‘PG’ because of Violence. This Fiction novel is set in the early days of World War II. It covers the ‘Battle of Britain’ (https://en.wikipedia.org/wiki/Battle_of_Britain) that lasted from late July 1940 through October of that year. Those months saw an aggressive air power battle between the British and Germans in the sky over Britain. This story follows Sergeant George Yeoman of the British RAF and Lieutenant Joachim Richter of the German Luftwaffe. Yeoman and Richter combat one another more than once in the sky. I thought that this story paints a good picture of the stress both sides were under during the Battle for Britain. Pilots and those interested in that era of flying will enjoy the many details that the author has included. I have read many stories from World War II, both Fiction and Non-Fiction. This book is short (119 pages and about 6 hours of reading), but I enjoyed it. I give this novel a 4 out of 5. 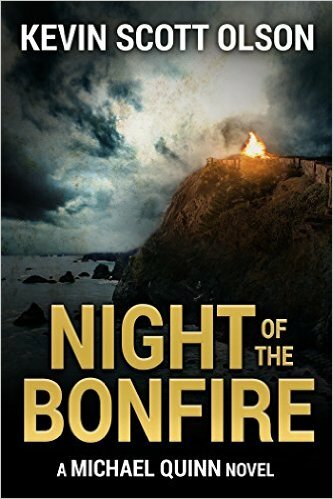 “Night of the Bonfire” eBook was published in 2015 (Dec) and was written by Kevin Scott Olson (http://kevinscottolson.com). Mr. Olson has published 4 novels. I obtained a galley of this novel for review through https://www.netgalley.com. I would categorize this novel as ‘R’ as there are instances of Violence. This Thriller novel is set mostly in California, USA, but it also touches on Rome, Italy and the Mexican coast. The primary character is former Navy SEAL Michael Quinn. Quinn is now working for the CIA as a contractor, taking on special projects. Quinn is at first assigned to track down a missing painting that is being used as currency between drug dealers. The painting was thought to have been destroyed during the Bonfire of the Vanities. If it exists, it will be worth millions. His mission focus soon changes from finding the painting to stopping a new drug from finding its way into the US West coast distributions system. There is quite a bit of action and intrigue as Quinn infiltrates the criminal organization thought to have the painting and works to halt the spread of the new drug. He must confront Marco Leone, leader of the criminal group and fanatic art collector, who turns into a powerful adversary. This was a novel written much in the flavor of Ian Flemming’s original ‘James Bond’ novels. This was a relatively quick read (only 3.5 hours) but I did enjoy it. I give this novel a 4 out of 5.